It appears that the US Air Force is taking recent reports of Russian and Chinese hypersonic weapon systems seriously, as it’s upped its game by awarding Lockheed Martin a contract worth up to US$928 million to develop a conventional strike weapon capable of flying over five times the speed of sound. The company’s Lockheed Martin Space division in Huntsville, Alabama will carry out the indefinite-delivery/indefinite-quantity contract on the air-launched stand-off missile. 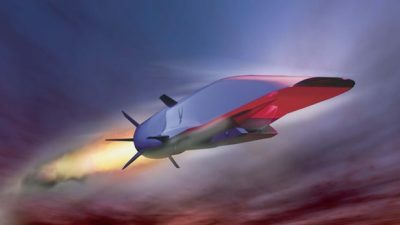 Hypersonic weapons have long been considered a potentially revolutionary weapon that permanently alter the battlefield of the future. By flying at speeds of over Mach 5 (3,836 mph, 6,175 km/h), missiles or ballistic projectiles would not only be far harder to engage and destroy with defences designed to combat incoming supersonic weapons, but their extremely high inertia would make these missiles extremely destructive even if they carried no warheads. Russia and China have already claimed to have not only created, but even deployed hypersonics, though the credibility of this remains an open question. Nevertheless, the US Air Force seems to be taking the threat of a new Sputnik Moment to heart with the new contract that tasks Lockheed with the design, development, engineering, systems integration, test, logistics planning, and aircraft integration support of an American hypersonic stand-off missile beginning in the 2018 fiscal year.